I was mystified when I came across pepitas in an ingredient list recently. I had never heard of them before and I needed to know what I could substitute them with, so that my plans could continue unaltered. There was no picture with the recipe nor a clue what they might be. Google to the rescue! Pepitas are nothing but pumpkin seeds. They are a popular snack in Mexico and are usually roasted and salted. They can be eaten hulled, or not. Raw or toasted. Salted or not. The kernels are eaten by themselves, too. They are also ground and used to make mole, a delicious Mexican sauce. I found roasted and salted pumpkin seeds in my local King Sooper's (Kroger's) in the aisle with snacks and nuts. We ate these unhulled till I realized that the quantity was being fast depleted. Then it became a game to see who could crack open the shell and pull the kernel out in one piece. The game worked cos all the seeds got hulled! I put aside as many as I needed, the rest disappeared immediately. For us, these could very well displace peanuts in the hierarchy of nuts that please. They make a delicious snack and V consumes them by the bagfuls. We discovered them in Holland a long time ago where we would gets bags of roasted salted kind (likely came from Turkey or Iran...) He consumeb 10kgs in 3 months! On our return we looked hard for them here. V can be very determined if he gets into his obsessive foodie thing - he searched high and low. He finally procured big fat pumpkin seeds being saved for seed (I pray they had not been sprayed...)! I get a handful every time I get buy really ripe pumpkin. 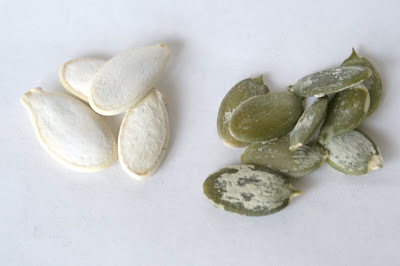 Anita, the problem with pepitas is that they cannot be stored for too long - they are rich in monunsaturated fat. But some more research told me that they can be frozen. So, if you want to enjoy a whole bunch of them, freeze them as you collect them! More fun for V! Swapna, it's not that tricky. You hold them such that the seam is pointing up, tap it lightly on the edge with a khalbatta (pestle) so that it cracks along the seam. Then it's just a question of prying the shell away and extracting the kernel. It's definitely time consuming. I enjoy them with the shell so I am willing to crunch right through it! A must in khauchi pishvi :). The melon and pumpkin seeds (magji/magaj)are ever favorite-especially roasted and salted! Good stuff to do after carving pumpkins :-D.
If you roast them with chili powder and squeeze on some lime juice, they will disappear even faster! Yah...good stuff dere they is! I've roasted them- (with the shells, I'm with you there. Good roughage)- and sprinkled them with chaat masala. I used to eat them in China everyday for hours... Great when reading a good book. Definitely Manisha, feel like a mouse nibbling on them to crack them open. I read the heading as "Papita" and was wondering why have u posted pumpkins reads and calling them as papita :(. For a long while I was not sure whether or not to remove the hull. I find hulled ones easy to devour. They are such a tasty low-carb, good-for-you snack. Musical, they will be in the khauchi pishvi from now on! Nupur, that's a great idea! I can't stop drooling at the thought! Pel, chaat masala also sounds good! Need to try my hand at mole, too. Ape, thank you for the Italian word for pepitas! If anyone know what they are called in other languages, please feel free to leave a comment on this post! Zlamushka, sounds like a good idea! Welcome to IFR! ISG LOL! That is why I just ate them, shell and all! Shilpa, yup! That's the way to do it! And no papitas on this blog yet! Suganya, if it tastes good, eat it! So I ate the shell!